Let me know if I missed any outputs that can be useful and I'll update this post. To exit from the output diagnostic, simply turn the key to the 'off' position and back on. With the audio power on, press the 'POWER' button and simultaneously press the 'AUTO-M' button for roughly 1 second. All the LCDs will illuminate. Inspect for any bad characters. Turn the audio off or the ignition switch to the ‘LOCK’ position to stop the diagnostic assist function. Press all the buttons. A buzzer sounds with each button pressed. 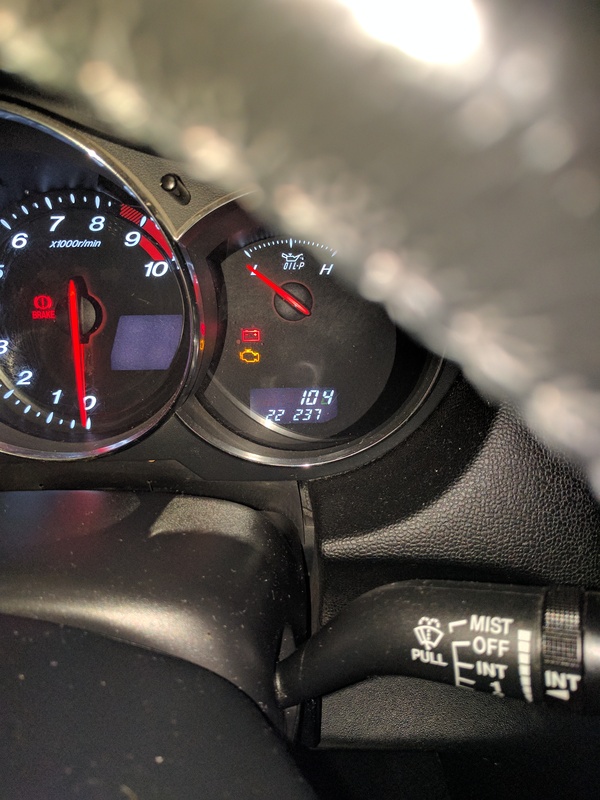 "A/C TEMP" should appear on the left side of the LCD display and a number from 0 to 16 on the right. With the audio power on, press the ‘POWER’ button and simultaneously press the ‘PRESET 2’ button for approximately 1 second. 2. While pressing the ‘POWER’ button, simultaneously press the ‘AUDIO CONT’ button for 2 seconds or more. Verify the security light state. After any malfunction is detected, the security light will function as follows for approximately 1 min. The security light illuminates for approximately 3 seconds and goes out. When any malfunction has been detected, read DTCs via flashing patterns displayed after the security light flashes or illuminates for approximately 1 minute. A verified DTC is flashed 10 times repeatedly by the security light. If multiple DTCs are verified, the security light displays only the smallest DTC. Bumping this for recent questions. Literally appeared in the odometer after displaying the previously mentioned. I am attaching a pic. This appeared and the car began to miss, all of this is following a MAF clean and memory reset. The end of my drive to work and the car sounded funny when I opened the door, heardissing and possibly a vacuum leak. No OBD codes, no indication outside of this little interesting display. Thanks for any insight in advance! Any solutions for this before I tear my car apart? Mine was because the original key was so worn it wasn't engaging the ignition properly, while the chip in the key and everything on the car was working fine.